One of the questions we get asked most is how to make the transition into aged care for a loved one as easy as possible. There is no doubt that making the decision to enter aged care, or that a partner or parent needs the 24-hour care provided by a nursing home, can be extremely stressful and emotional. There are steps that you can take to make the transition easier – and your Senexus aged care placement specialist can talk to you about the right strategies for your family. In general, the transition to aged care can be easier if the person entering care has their say in the decision making, such as when to enter care and in choosing the nursing home that will become their home. The transition is often easier if the person entering care is able to preserve some of their autonomy and knows that they will be able to maintain their existing social relationships. But… this is often not the case. The person may be resistant to entering care or their health may mean that preservation of autonomy and participation in the decision-making process is just not feasible. Mum or Dad may be fearful of what entering a nursing home means, or of the change and unknown it represents. They may also be of the belief that they don’t need the extra support provided by a nursing home. Prior to the person entering care, check with the aged care home regarding the support services and mechanisms they offer to new residents and their families. Many facilities have specific programs in place to make the transition a more positive experience. The good news is that you do not need to go through the process alone. We have helped many families in Adelaide find the right aged care facility for their loved one. 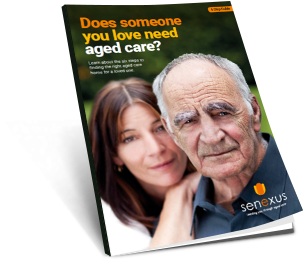 Your Senexus aged care placement specialist will guide you and your loved one through the process of entering aged care, as well as provide practical advice and tips to ease the transition.